A storm will hit the South during Saturday night and much of the mid-Atlantic and southern New England on Sunday bringing a dose of drenching rain, minor flooding and travel delays. Those taking to the roadways should expect poor visibility from the driving rain and be wary of water collecting on portions of the highway that drain poorly. The rain will be heavy enough to cause flash, urban and small stream flooding. However, fast movement of the storm system will prevent widespread and major flooding of larger streams and rivers. A general 1 to 2 inches, with locally 3 inches of rain is forecast and should be handled with few problems on the major rivers. Downpours, fog and low cloud ceilings can lead to flight delays. The storm was already spreading rain across the Gulf Coast on Saturday morning. It was a wet drive along the I-10 corridor from much of Louisiana to Mississippi and Alabama. 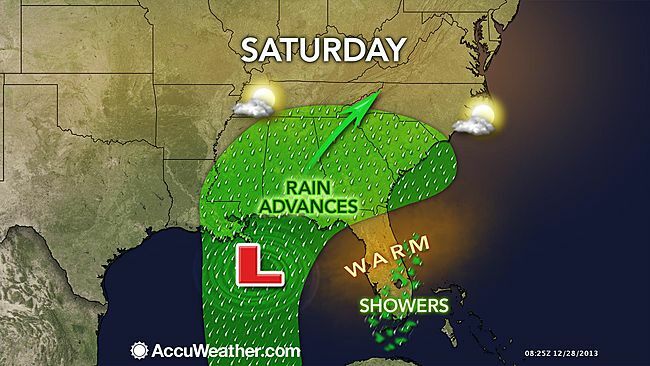 Atlanta can expect rain on Saturday afternoon through Saturday night, but improving travel conditions on Sunday. Farther northeast along the I-85 corridor, rain will soak the Charlotte and Raleigh, N.C., areas on Saturday night into Sunday morning. Expect a miserable drive Saturday night along I-77 with rain, but also fog over the high ground. The rain will reach Richmond and Roanoke, Virginia, late on Saturday night. A couple of the strongest storms can produce a short-lived tornado. On Sunday, rain and thunderstorms will push southeastward across the Florida Peninsula, while clearing sweeps from west to east across the interior South. Farther north along I-95 from Washington, D.C., to Philadelphia and New York City on Sunday, rain will spread northward. A breeze will cause the rain to be windswept at times, further reducing the visibility and adding misery to those attending NFL games. The rain will reach across southern New England on Sunday afternoon and evening from Hartford, Connecticut, and Providence, Rhode Island, to Boston.